DUBLIN, Ohio (AP) One shot on the wrong side of the creek. One shot in the water. Another one in someone’s backyard. On the par-5 15th, Woods had two mighty swings – one that sent the ball well to the right; one on the way back, leaving him to slam his club into the turf in frustration. The ball went over an iron fence and into a backyard, out of bounds. The front nine was a big deal, starting with that 3-iron over the water. He two-putted from about 50 feet for birdie, found the fairway on No. 6 that left a wedge into 3 feet for a tap-in birdie, and then hit out of a greenside bunker and used the slope for it to roll out to 2 feet on the par-5 seventh. Woods got up-and-down for par on the ninth from 62 yards in front of the water after a poor drive, and that was big, too. 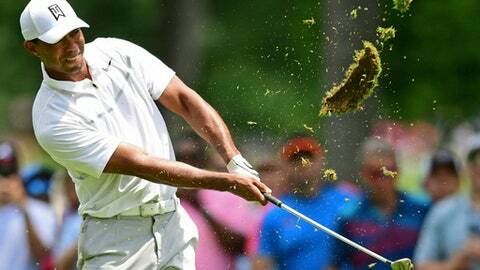 No one likes ending a round with a bogey, and even par at least kept him within seven shots of Hideki Matsuyama, Abraham Ancer and Joaquin Niemann. Lunch had to wait. He first headed for the putting green for more practice.